... a turkey and gin sandwich, on the other hand, could be perfectly acceptable. That implies leftover gin. An alien concept, if ever there was. Perhaps I can conjure some baubles into something! 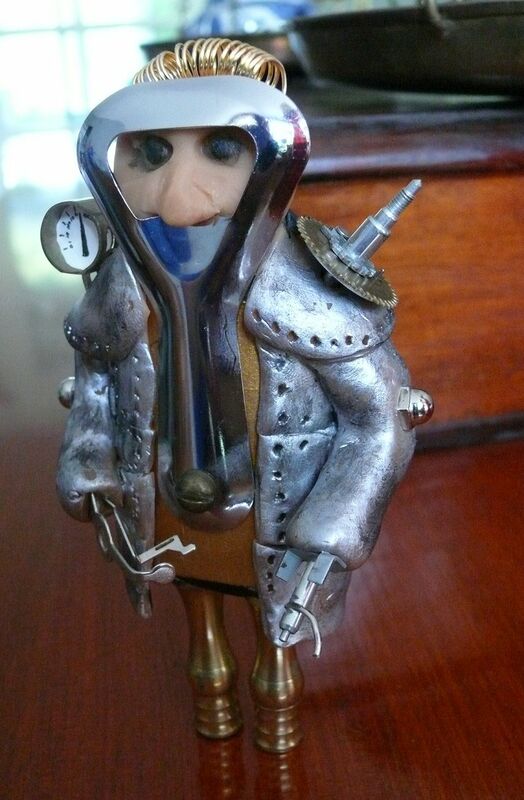 Hmm... My Christmas trinket were nail-clippers and the bloke’s was a bottle opener. I will have to see what I can come up with. Challenge accepted! No Christmas crackers at all this year! I will have to provide them next year. And hopefully when said crackers were not home made, acting as mini grenades at the table. Does it count if the Christmas Cracker contents had to be surgically removed from a family member? Hmm... 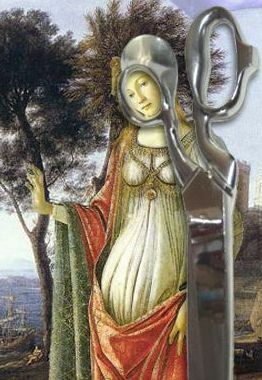 The juxtaposition of the blood on the object could well enhance the viewer's perception of the piece. The parts donated by the cracker are the curled wires; they were one of those puzzles where the wires are intertwined and you have to work out how to separate them. All of two minutes fun... The other Christmas related parts are the two bumpy silver items. They are the caps off two baubles I used a couple of years ago to make our airship decoration. 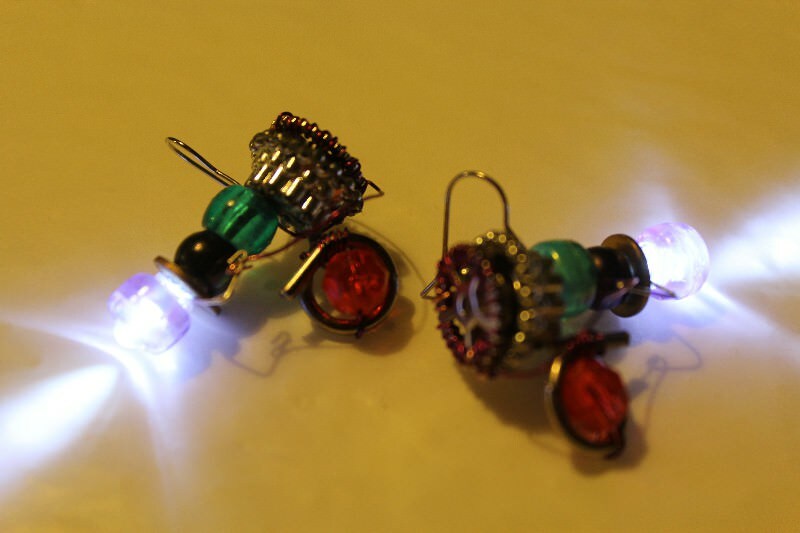 The button cells to power each LED are in the caps and the cog on the end does have a purpose ( )- it's one of the terminals for the batteries, the other being the metal wire from the cracker puzzle. We didn't have crackers but I did buy some decorations ridiculously cheaply a couple of weeks ago because the shape just said 'steampunk power crystal'. I have no idea what they are going to be used for - something that needs steampunk power crystals I suppose! Thank you! 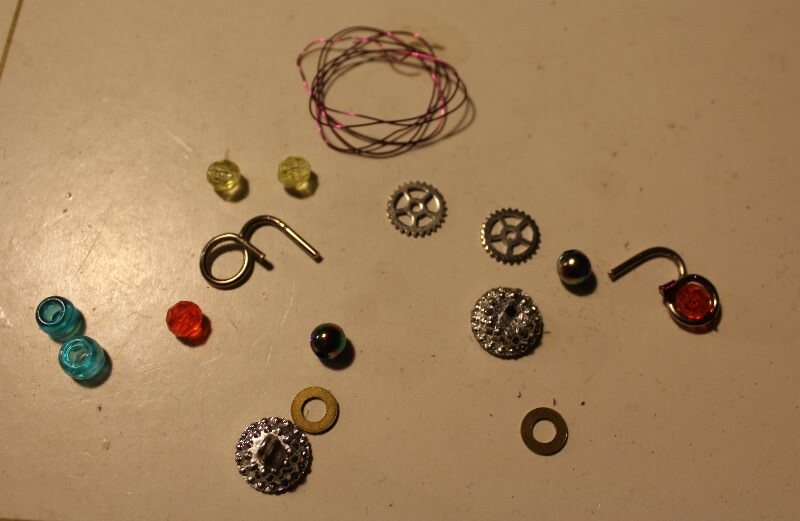 It's always good to have bits and bobs in stock; it may not be obvious just what they'll be used for now, but at some point they will be the perfect thing for that new project. They look great, Miranda, but now you have put the pressure on... 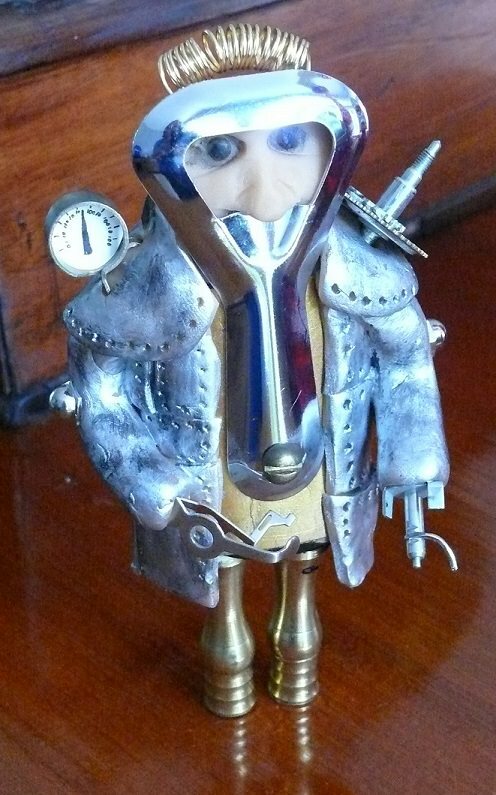 I spent a bit of time last night trying to figure out how to make a Steampunk creature out of the nail-clippers and bottle opener that we got in our Christmas crackers... I now, at least, have an idea! I'm looking forwards to seeing the little beastie! And I could have polished up the brass a bit, but I wanted to get it done before next Christmas! Oh, I do like Ned!! I will even forgive the taking of cousin Ned's name in vain for your little sculpture. And I bet those ray gun earrings will be a hit next Christmas - "Hand over the trifle, or I will fry you with my earrings!" He is lovely! His face is just brilliant and his coil haircut is the perfect finishing touch . It's a thought; although I'm so clumsy I'd probably end up burning off my own earlobes . So cute; does he have a backstory? 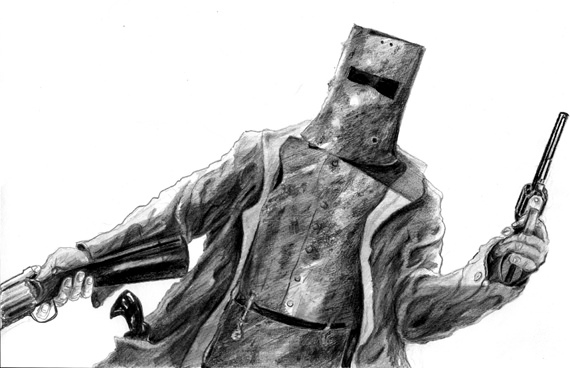 I guess he looked a bit like Ned Kelly (Australian Bushranger). Hopefully without his criminal tendencies. Yes, I have no idea why such a man achieved the 'status' that he did. He was a filthy, murdering (person whose parents weren't married). Why movies depicted him as the poor, decent man fighting against the evils of tyranny I will never understand. He was never decent. Well, technically, as his parents were married he wasn't one of those at all! His mum and my great-grandmother were cousins. And their backstory was quite interesting!! Yes, I know we're only just past Easter but it's never too early to think about Christmas, is it? The heart is the decoration, although the faux purls on wire were the decoration from a Christmas cracker. The heart originally had placcy red 'jewels' and a multicoloured bow, which were quickly removed. It was hollow, but I split it into two so that some scrap material could be put into it. The halves are held together by the copper cord; the idea is the material inside can be changed to work with the frock it is attached to (via buttons wired onto its back). 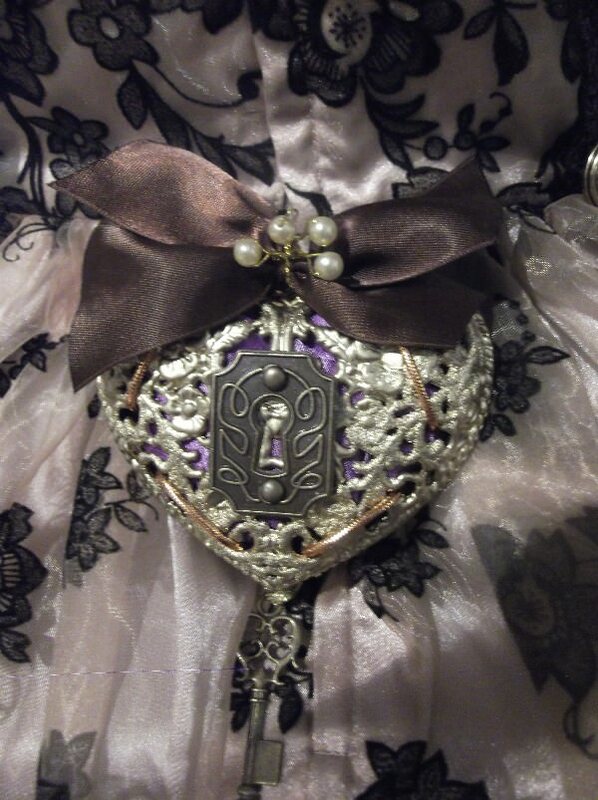 The lock cover and key were from The Works craft section and the bow from my bits and bobs box (wired on so again this can be changed to match the frock).